You'll need some ww yarn with a 5mm hook plus some embroidery thread. This is a crochet pattern, not a finished item. You will be NOT be receiving a completed item in the mail, but a pdf with instructions on how to crochet this item. Do not purchase if you don't know how to crochet! 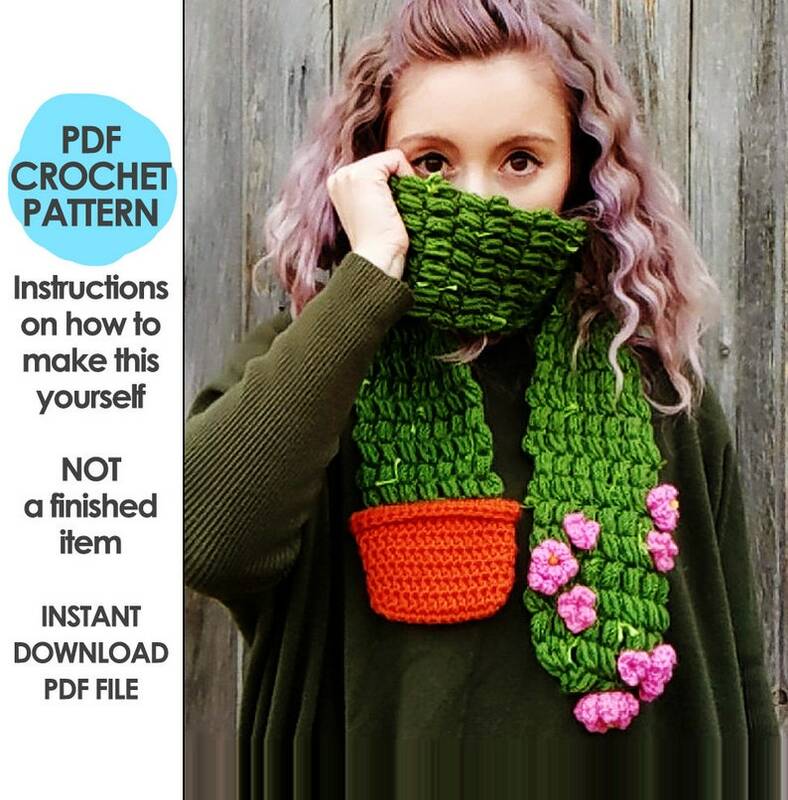 >> This pattern will not teach you how to crochet in the round, or how to change colors, or how to sew pieces together, or how to embroider a mouth etc. You need to have a basic knowledge of these things already. Finished item is available to order, you'll find it in the "made to order" if currently available. Very fun cute pattern, well written and easy to follow! Fun pattern and easy to follow. I'm half way done the scarf but didn't want to wait to review. I also bought the octopus scarf pattern a long time ago and finally got around to making it this summer. It was super fun and turned out great! Thank you for another great pattern! Very cute pattern! I can't wait to make it! OMG seriously, i had to make 134 rows when it said I only had to make 68. I ripped that sucker out so many times it wasn't funny. Definitely not for a novice. Good thing I have been crocheting since I was 13. Yes I will happily make custom or personalized orders, just send me a message! Please handwash in cold water and lay flat & reshape to dry. Some items are available for wholesale! You'll see "WHOLESALE AVAILABLE" at the bottom of a listing if it's available. Please message me for details. Do you design all of the crochet patterns? Will you do a custom crochet pattern for me? It depends on how do-able it is, and my availability. Shoot me a message! I can't find [pattern] as a finished item for sale in your shop, will you make me one? Maybe, but probably not. Some patterns are extremely time consuming and take many hours, and I'd have to charge a ton of money for them. Message me, but don't hold your breath!